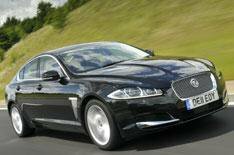 Jaguar XF 2.2 diesel reviewed | What Car? What is it? The Jaguar XF has run off with the What Car? best executive crown four years running now, but with a choice of either 5.0-litre V8 petrol or 3.0-litre V6 diesel engines, it has always had limited appeal to cost-conscious business users. Not any more. To coincide with a mid-life face-lift, Jaguar has launched its refreshed XF with a 2.2-litre four-cylinder diesel engine. What's it like to drive? Is this engine not a bit weedy for such a big car? Not a bit of it. Yes, its responses aren't quite as instant as those in the V6-powered cars, but with 188bhp and a crushing 332lb ft of torque, it has the bragging rights over the likes of BMWs 520d and Audis 2.0-litre A6 - and theyre not exactly short of get-up-and-go. Whats more, the Jag comes with an all-new eight-speed gearbox, which is smoothness personified. Admittedly, a four-cylinder engine is never going to be as silky smooth as a six-cylinder unit, and, yes, you do feel some vibration through the base of the drivers seat at idle, especially when the engine is cold. Also, accelerate hard and theres no disguising the fact youre driving a diesel, but once the car is settled into a cruise youll struggle to tell it apart from its larger-capacity sibling. The entry-level XF still drives as a Jaguar should. No other executive car can match the XFs wonderful blend of fluid handling and comfort. Its sharp, accurate steering and neutral front-to-rear weight distribution mean it flows through bends with the agility of a sports car. Equally, when youre just cruising to your next meeting its as relaxed and as refined as the best luxury cars. Whats it like inside? There are small but welcome improvements. More-supportive seats provide better long-distance comfort, new materials create a slightly classier feel and theres a new touch-screen entertainment system thats much more user-friendly. In all, the XFs cabin is a better place to spend time, but its still not as classy or comfortable as a 5 Series. Should I buy one? This new XF has massive appeal, partly due to its more contemporary look and partly due to its attractive 30k list price and comprehensive equipment list. More pertinently, this 2.2-litre version is capable of a very impressive 52.3mpg on average. Hang on, though, thats still quite juicy compared with a BMW 520ds 57.6mpg. More telling, the XFs 149g/km CO2 output places it four bands higher in the company car taxation scale. As a result, you can expect to pay 41 per month more in tax than you will with the BMW. If youre heart is set on an XF, though, you can be safe in the knowledge that youre driving one of the best executive cars on sale.